During Children's Week this October, families can bring their children to the Cheltenham Community Centre for an array of fun activities designed especially for their enjoyment at this year's Children's Festival. Being held in conjunction with the City of Kingston, Beaumaris Rotary and the Southern Community Church of Christ, the Children's Festival will elicit squeals of delight simply from the range of small-children's carnival rides. 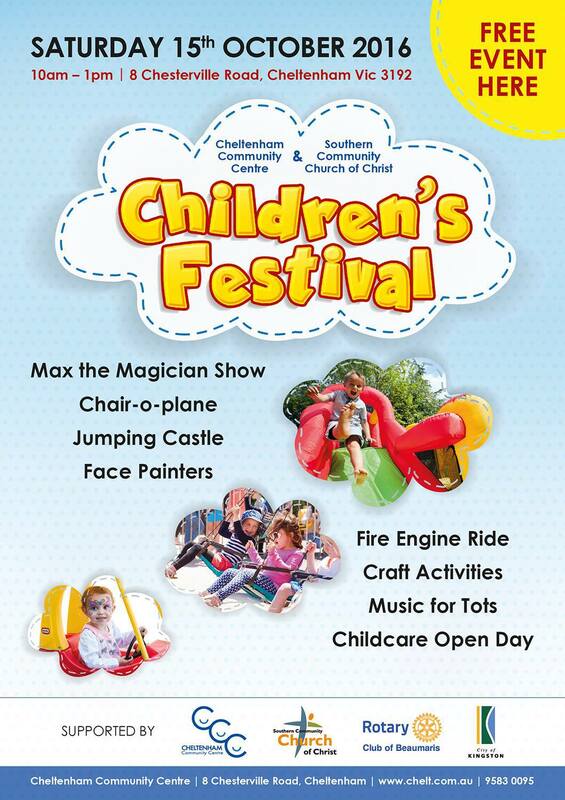 There will be a chair-o-plane, jumping castle and fire engine ride for tiny tots. In addition to the rides, be amazed by the Max the Magician Show, participate in some crafting activities, enjoy some live music and entertainment and be sure to visit with the face painting angels for some extra special dress-up colours. The Children's Festival is being held on Saturday 15th October 2016 from 10am to 1pm at the Cheltenham Community Centre, 8 Chesterville Road, Cheltenham. Entry to the festival is free.